Today we’re going to go over sewing our skirt and using our clear elastic to shirr it. From here on out, all versions are the same. Because of the inseam pockets, assembling the skirt works best on your regular machine. 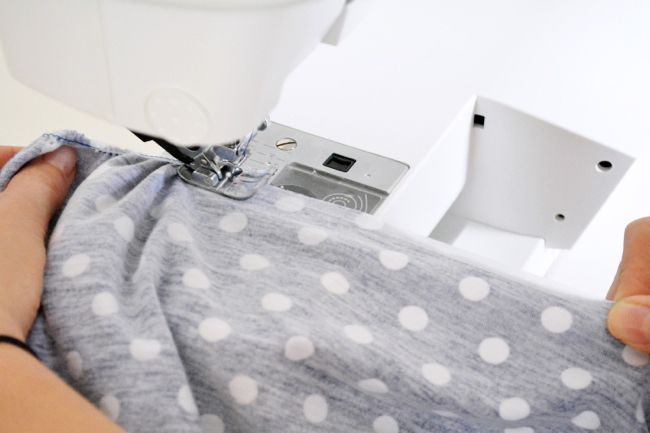 Pivoting on a serger gets into some tricky business (and sometimes isn’t possible). If you’d like to omit the pockets, you can just skip attaching them and sew straight down the side seams. 1) Finish raw edges. 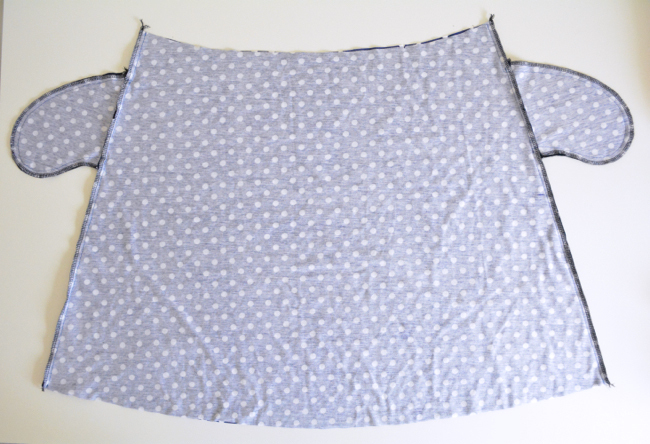 Finish the side seams of the skirt and all edges of the pockets with the method of your choice. 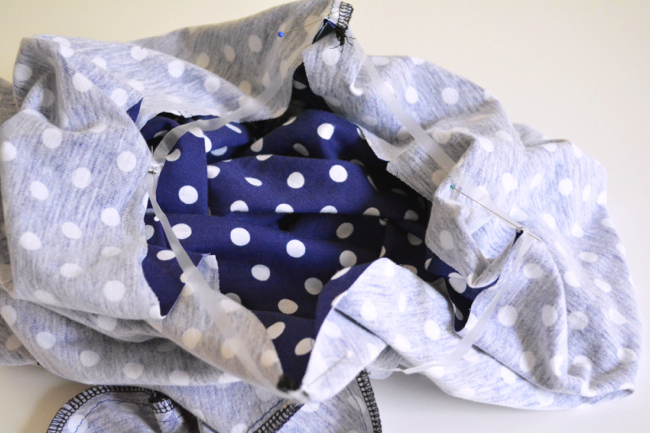 2) Attach pockets. 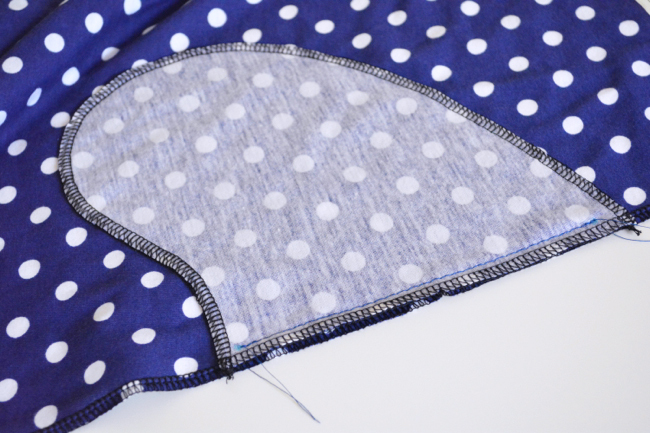 Pin a pocket to a skirt side seam, right sides together, aligning small dots and notch. 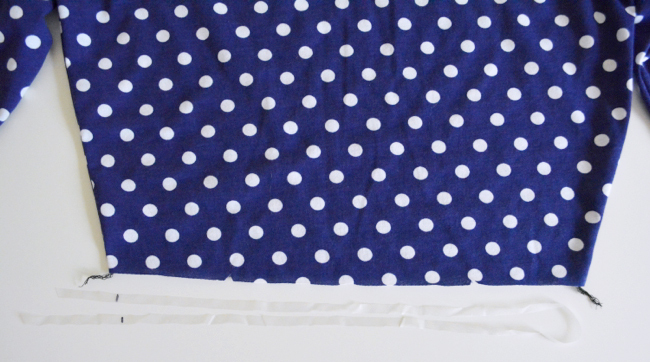 Stitch from dot to dot with a scant 3/8” seam allowance. 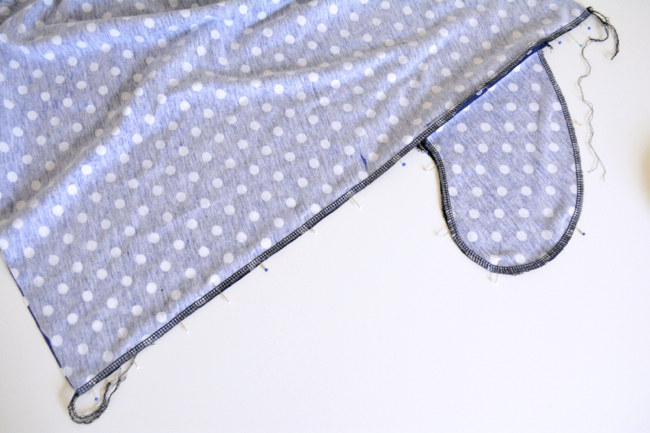 The scant seam allowance helps ensure that the edges of the pocket won’t be visible on the outside of the skirt. Repeat with all pocket pieces so that two pockets are attached to each skirt. 3) Pin skirt. Fold pockets out and away from skirt. Pin skirt pieces right sides together along side seam and around pockets, aligning pockets. 4) Sew skirt. Starting at the waist, sew side seam, pivoting to go around the curve of the pocket and again to continue down to the bottom of the skirt. Make sure that your pivot points at the top and bottom of the pockets land to the inside of the pocket seam. Repeat with other side seam. 5) Prep elastic. Measure the bottom edge of your bodice. 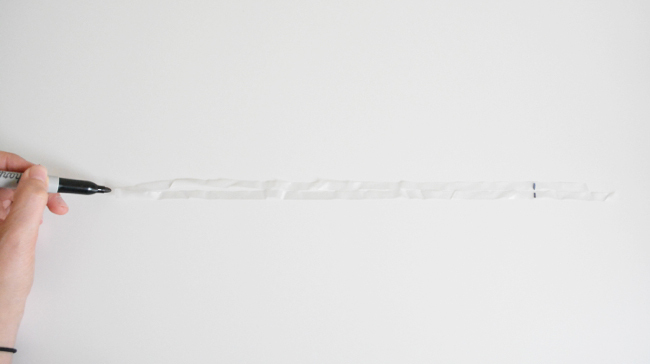 Cut a piece of elastic that’s a few inches longer than your measurement on both ends. Mark the measurement on the elastic. 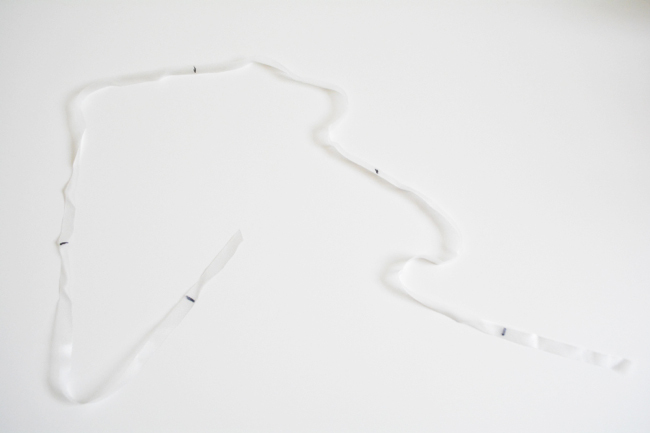 Fold the elastic in half, aligning your marks, and mark where it’s folded. Now refold it in half the other way and mark the two new folds. You should have five evenly spaced marks. 6) Pin elastic. With skirt wrong side out, pin first mark on elastic to a side seam. Pin the other marks to the skirt centers (they should be marked by snips) and the other side seam. 7) Baste elastic. 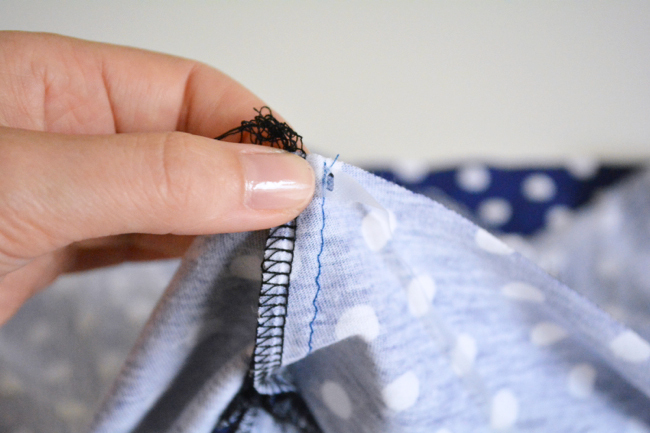 Using your standard machine and a straight stitch with the longest stitch length, baste the elastic to the top edge of skirt, stretching the elastic as you sew so that it’s the same size as the skirt. This takes a little coordination. Depending on the strength of your machine, you may need to use one hand on the fabric behind the foot to help it move through the machine while you’re stretching from the front. Try to keep the elastic stretched evenly while you sew, otherwise you might end up with inconsistent gathers on your skirt. Once you’re done, look at that! 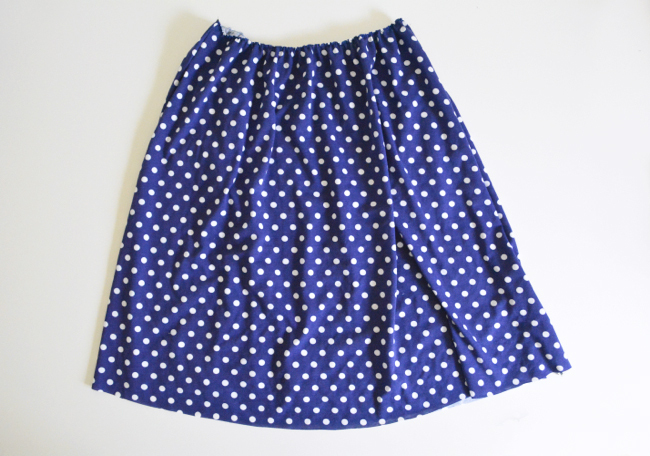 A shirred skirt with pockets. You have the weekend to get caught up if you need to, then we’ll be back to finish up our dresses with our final sewing post on Monday. Would you recommend using the ball point needle for the elastic or a stretch needle? Thanks! The ballpoint needle will work just fine! In the last picture is that a regular sewing machine or a serger? PS I love the fabric you used! It’s a regular sewing machine. So the elastic is sewn in the seam allowance, not on the seam line. Is there any particular reason to use clear elastic instead of regular fabric/braided elastic. Somewhere I read someone complaining about the feel of the clear elastic on your skin. Clear elastic is less bulky and fits into the seam nicely, but braided elastic would also work. It just might make a thicker seam and may be more visible as a ridge from the outside of the dress. What is the advantage to serging the seams edges separately before the seams are sewn together as you have shown, as opposed to serging them together after the seams are sewn? 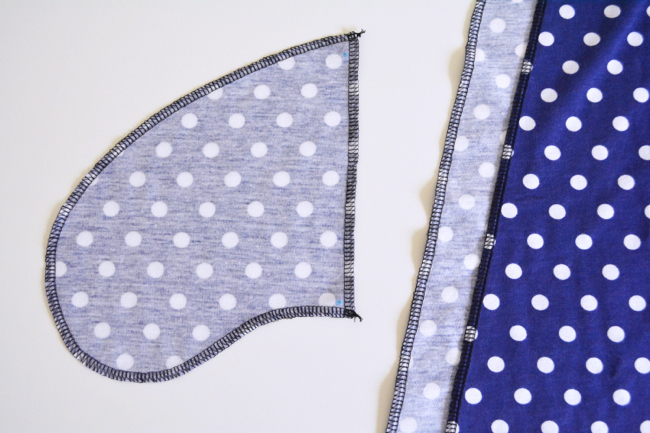 After everything is sewn together, you won’t be able to serge into the corners at the top and bottom of the pocket because of the serger blade position. Also, the straight edge of the pocket and that section of the skirt edge are inaccessible. 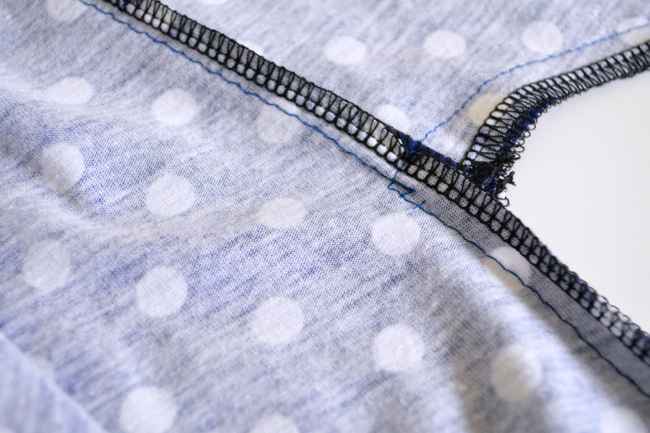 If you’re using a standard machine for everything, you can finish the straight edge of the pocket after you attach it, and then finish all the other edges after the seam is sewn. I tried serging the pockets to the skirt pieces and it was a complete disaster!! I somehow got it attached, but not without totally hacking away at the pivot corners….it was ugly. Thankfully my fabric is so busy and drapey that it’s not too noticeable to the untrained eye. Definitely won’t be doing that again! I was only able to find 3/8 clear elastic, so I’m assuming it needs to be trimmed before shirring else it will show through the seam line Is this correct? I’ve used 3/8″ before without trimming it. As long as the elastic is on the wrong side of the skirt fabric, even if it peeks out of the seam a little bit it won’t show from the right side of the garment. I have a serger that has a opening for clear elastic on the foot. So all I have to do is feed in the elastic and it will attach to the seam allowance. Will that work here? Do I put it in neutral or do I adjust the differential feed at all to do this? If it were me I would still use the regular machine to baste it on, because otherwise it sounds like you would be serging over the same thing twice [once to attach the elastic and once to sew the skirt and bodice together]. This would make the seam very bulky since there is so much thread involved in a serged seam. I’m not sure about your settings as I’ve never used a serger with a special clear elastic foot. Sounds neat though! The best thing would be to consult your manual. If anyone else has any info for Suzanne, please chime in! Devon, how do you serge around curved edges/corners (e.g. pockets, armpit) and stay accurate? I feel like I can’t get the fabric to turn when I want it to! I feel like a lot comes with practice! What I used to do to help myself is mark my seam allowance with a water soluble marker at any tricky areas, so I could keep one eye on the left needle and make sure it was stitching right at the line. I also find that it helps to straighten inner curves [like the armpits] a little bit as they go through the machine. Hi, hope this isn’t a silly question. I bought a walking foot and so far so good. Just wondered can I use it for the clear elastic (or does that defeat the purpose)? Also, can I use it with a twin needle? Btw I’ve picked up so many hints and tips on this sewalong. Really invaluable. Many thanks. You can do the clear elastic with or without the walking foot, but if anything the walking foot would probably help! And I’m glad you’ve enjoyed the sewalong! I’m a couple days behind and just now trying to attach the elastic to the skirt. My elastic looks like it is too short to attach all the way around the skirt. I understand that it has to be somewhat short because I’ll stretch it when I sew it to the fabric–but there is no way it can stretch that far. When I line up the first mark on the elastic to the seam and then line up the next mark on the elastic, it matches perfectly…. That seems odd. But the rest of the skirt I have to bunch it up to match up the marks and notices. When I get all the way around the skirt, there is a couple inches of fabric that don’t seem to have any elastic to match up with the fabric. Do we sew in the “extra” inches that we left when we cut the elastic? I’ve double checked my elastic against my bodice and triple checked the directions. Maybe I’ve cut my fabric incorrectly. Any suggestions? Any alternative pics of this process? Ok, it’s me again. Never mind. That elastic really does strrrreeeeetccchhh that much. Wow. It was just really tripping me up to look at it. Totally wearing this thing to Thanksgiving Dinner because I’ll be able to eat the whole turkey. Glad you got it figured out! And yes, I like your Thanksgiving plans!! Sorry, just getting caught up with the sew-a-long, and I am wondering if anyone else had problems with the pockets. I had the hardest time with the corners, and finally ended up just taking them out to make a dress without pockets. The pocket corners were a bulky mess. Just wondering what I did wrong. Thanks! Oops, my toddler cut off my comment in the middle. Anyways, I was wondering if anybody has any suggestions for finishing the seams on a regular sewing machine if mock-overlock isn’t working. I really can’t get this to work. I chickened out on my first Moneta and gathered with basting, but it didn’t stay very even as I sewed the bodice on. I’m making another, and decided to try the stretch as you sew again. It’s terrifying! I have to stretch the elastic to twice its length to match up the markings, and I’m afraid of it ripping and really smacking me. My machine usually can’t pull it through and so it makes a big knot at the end, or worse, slips backwards with each stitch. I’m already using both of my hands to hold the fabric in front, so I can’t help pull from the back. I’ve tried to get it started two or three times and I’m afraid I’m starting to stretch out the skirt fabric. Any tips to help on this? Yep, I also first tried the clear elastic which I have used previously on another garment. However, due to the rolling edges of knit fabrics, I needed a third hand to unroll the bodice edge roll as I went along, and just couldn’t make it work. So I did regular gathering using 2 rows of basting and used the clear elastic as a stabilizer, and it looks gorgeous…….BUT, since I’m new to sewing, didn’t realize that the waist wouldn’t stretch when I put it on!!! Fortunately, I’m skinny and can ooze myself into it, and it looks fabulous! So does a gathered waist required an opening on the side or back, or did I do something wrong?? Did you attach the elastic using a stitch that stretches? And also use one on the waist seam? Oops, no I didn’t…..would that be a 3-step zig-zag? I’d like the skirt on my Moneta to have a bit more volume. Could it be possible to cut it in my size (M) at the waist, and then grade up to a L or XL at the hem? I tried twice to attach the clear elastic. The first time it stretched so much I had a good 7-8″ left at the end and the skirt was gathered way to tightly. The second it seemed to work out, but once I attached it to the bodice, it was clearly too small, and uncomfortably tight. I’m leary of trying a third time. Any suggestions? Should I just bite the bullet and cut an extra large piece this time and try again, or do gathers with basting? I’ve just made my first Moneta and found my waist seam sticks out almost at an angle. I used my elastictor foot that came with my Juki over locker (I’m a beginner with over locker) and that worked pretty well. But I couldn’t work out if elastic was to be sewn on through exact middle of elastic or not. Devon was right about bulk with over locked seams and then elastic as well. I cut it all off and started again but then decided that edgestitching the elasticated seam to the bodice may help it lay flat. It didn’t… I am still wearing dress though as I learnt a lot of new techniques as and sewed knit fabric for first time, though feel a bit self conscious about seam sticking out. Anything I can do about it now?